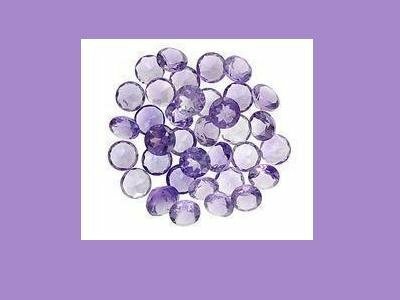 The 11 gemstones that are in this Amethyst group are varying in color from light pinkish purple to a medium pinkish purple. They would be great as accents around a larger gemstone in a setting. They are 3 mm in diameter with a Round Cut/Shape. These gems are nicely faceted and eye clear unless otherwise noted. Our gems are natural genuine and not lab created or cubic zirconia. This is a stock photo and may differ slightly than the photo shows. We try to be as specific as possible but all measurements are approximated. All gemstones may be combined with jewelry purchases for the discount shipping price. If you would like a gemstone holder/case/jar, please see our gift box area to order one. We prefer Pay Pal but will acccept personal checks, money orders, and Bid Pay within 7 days of auction end. We also ship to Canada, UK and Austrailia and some islands for $4.00 plus $.50 S&h per item after that first one-US funds only. Please see our terms page for more information.